Celebrate summer, America and all the delicious food our great country has to offer. Get festive for America's birthday this year with red sangria, a firecracker salsa, color-coded hors d'oeuvres and much more. As long as the wine is inexpensive, fruity and tastes good on its own, it’ll work well in sangria. 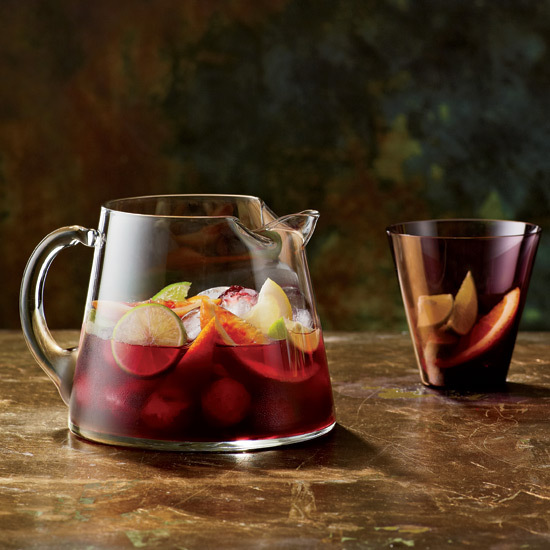 No need to use a $30 bottle for sangria, but you should probably skip that undrinkable plonk in a jug. (Wine in a can, however: That’s another story). As long as the wine is inexpensive, fruity and tastes good on its own, it’ll work well in sangria. Red. When making red sangria, you want to look for something that’s fruity with low tannins. And since the drink originated in Spain, and Spain is home to some of the best red wine values, why not start there? Wines made from Garnacha (aka Grenache) have lots of ripe cherry flavors, while Monastrell (aka Mourvèdre) have darker fruit flavors and black peppery notes. Inexpensive Tempranillos tend to be herbier and spicier and are a good choice as well. A couple sangria-worthy options from outside Spain: Malbec or Bonarda from Argentina, which are often great values. White. White wines don’t usually make you contend with tannins, so most of them are fair game when it comes to sangria. For the freshest-tasting drink, just avoid a wine with lots of oak. If you want a light and zingy sangria and are using garnishes like herbs, cucumbers, lemons or limes, choose a bright, high-acid white, like Vinho Verde from Portugal or dry Riesling from Germany. If you’re feeling more of a tropical fruit or ripe peach kind of vibe, go for a white that’s more lush, like Viognier or Pinot Gris. Rosé. Save the super-dry and mineral Provençal rosés for your salade niçoise. Instead, opt for more fruit-forward pink wines from California or Spain, where rosé is known as rosado. Sparkling. While not typical, sparkling wine can be great in a sangria (this one proves it). Cava is one of the world’s great bubbly wine values, so why not just go with it? Even better: Cava is from Spain, of course.